Poor Avery has been sent off to Cowboy Camp and he doesn't fit in. His hat is the wrong size, as are his boots and even his attitude! Cowboy Dan who runs the show promises to turn Avery and all the other boys into real cowboys by the time they are done. "By the time I finish with you, you'll be actin', walkin' and talkin' like honest-to-goodness cowboys." I reckon though that Cowboy Dan met his match with young Avery. Why, he doesn't even like the grits and beans! What kind of real cowboy doesn't like grits and beans?! Young Avery was beginning to feel right sorry for himself until he was approached by a bad guy, who stumbled upon the campfire late at night. The bad guy is on the look out for Cowboy Dan and Avery is the first man on the scene who has a crack at ridding the camp of this bad dude. This clever and cute book has a real western flair to it and I thought it was a lot of fun. 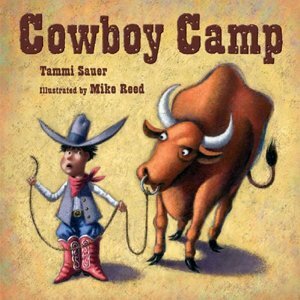 Written by Tammi Sauer and illustrated by Mike Reed, I can think of one little Buckaroo who I think will really enjoy this tale! 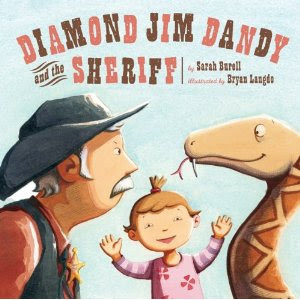 Another fun western read is Diamond Jim Dandy and the Sheriff which was just released this month. I've reviewed Diamond Jim along with several other new picture books released in 2010 over at 5 Minutes for Books. To read my reviews of some of the latest titles, as well as to enter a contest to win a copy of each book (!) hop on over to 5 Minutes for Books and have a rootin' tootin' good time!